Simple is what I am all about. I have always been one to wait until the last minute to get things done. I do some of my best preschool planning while drying my hair and brushing my teeth! The activities that we do in preschool (and at home!) are super simple but still super fun. This includes our latest activity that teaches colors and helps practice color matching with stickers! Affiliate links included in this post for your convenience. Putting this activity together takes no time at all. Most supplies you probably have on hand. We used large easel paper for this activity. Three sheets of the paper were used to cover one of the tables in my classroom so that there was enough room for multiple children to play at one time. The reinforcers that I used had 4 bright colors in the pack, so I used the same colored Mr. Sketch markers to draw my circles on the paper. 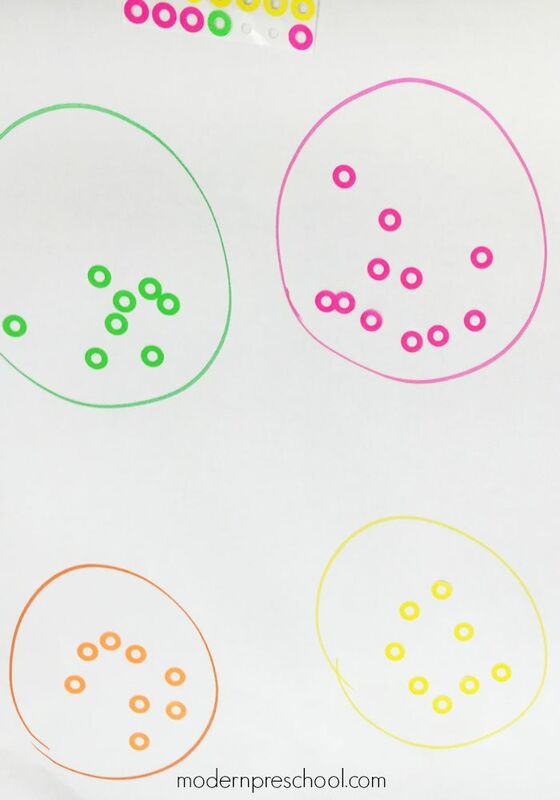 I could have used a circle pattern (or paper plate) to trace actual circles on the papers, but honestly my preschoolers didn’t mind at all! We had gone over how to peel the stickers off the paper during circle time, so most of the preschoolers had no problem using their fine motor skills for this part of the activity. 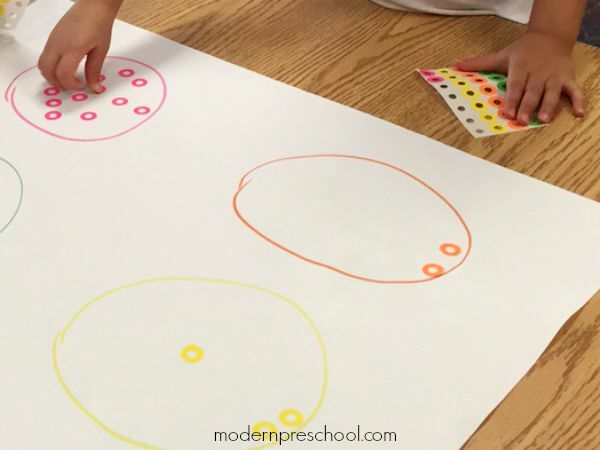 Some quickly applied lots of stickers to the correct colored circles, and some little learners took their time to carefully peel and stick each reinforcer on the paper. 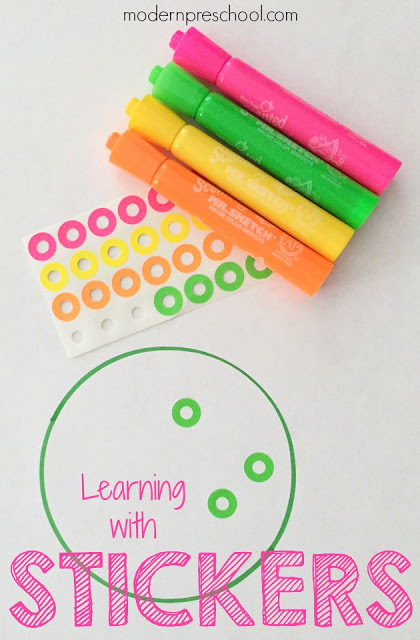 This activity was a huge hit with my preschoolers during their first week of school! They practiced color sorting, matching, color recognition, used their fine motor skills, and worked together. If one sticker was mistakenly placed in the wrong circle, another friend would quickly peel it off and fix it. 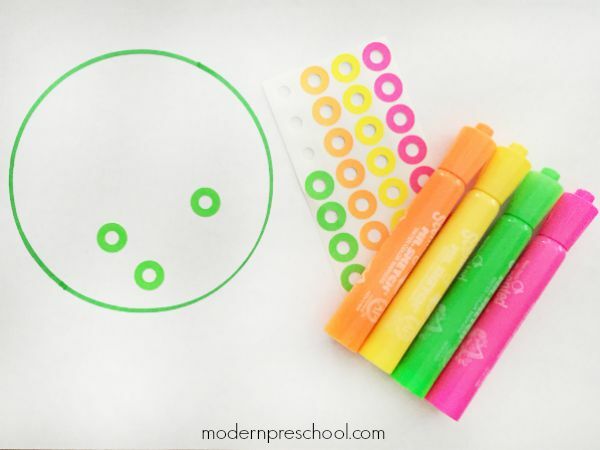 This simple learning activity helped build confidence in my new preschoolers too! The repetition of the expected outcome was fun and 3 year-olds love to be able to do things independently.